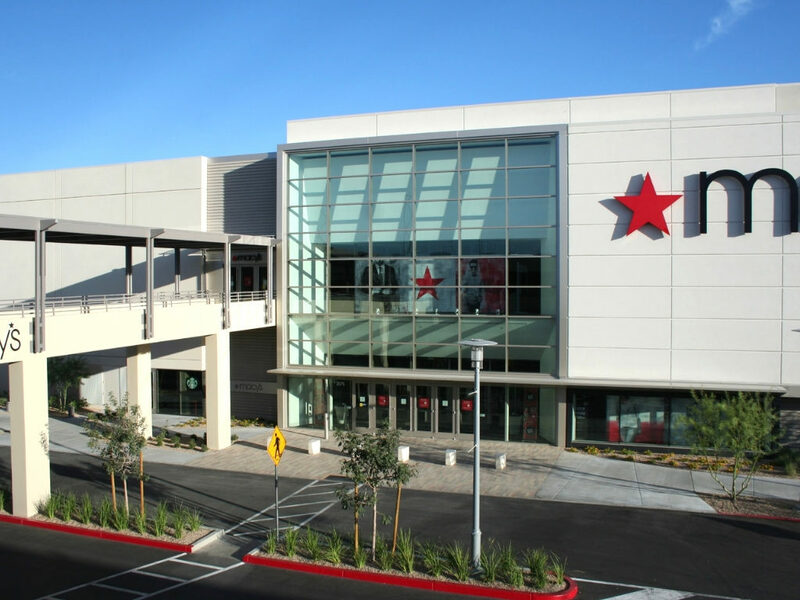 A359 provided architecture services for a new Macy’s department store in Downtown Summerlin in 2014. The mixed-use development of Downtown Summerlin is located in the western outskirts of Las Vegas. 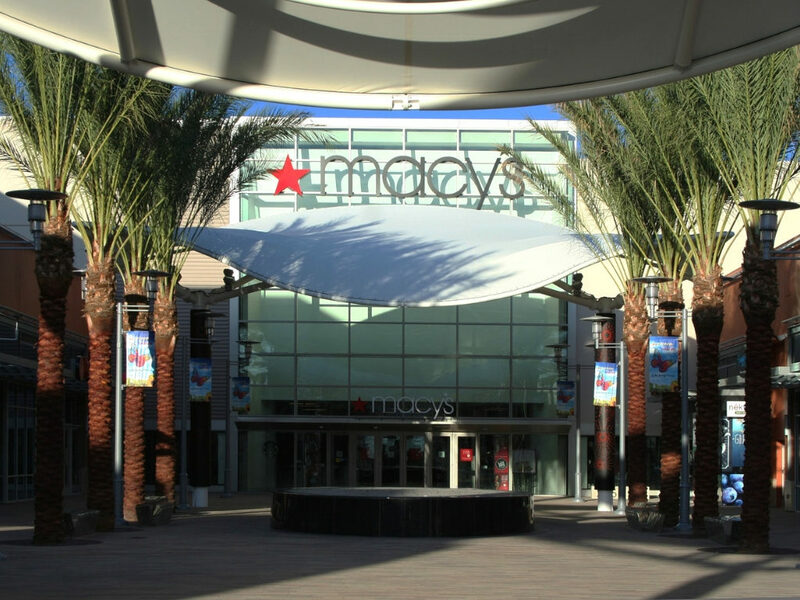 Downtown Summerlin, a master-planned community combines retail, residential, restaurant and entertainment spaces. 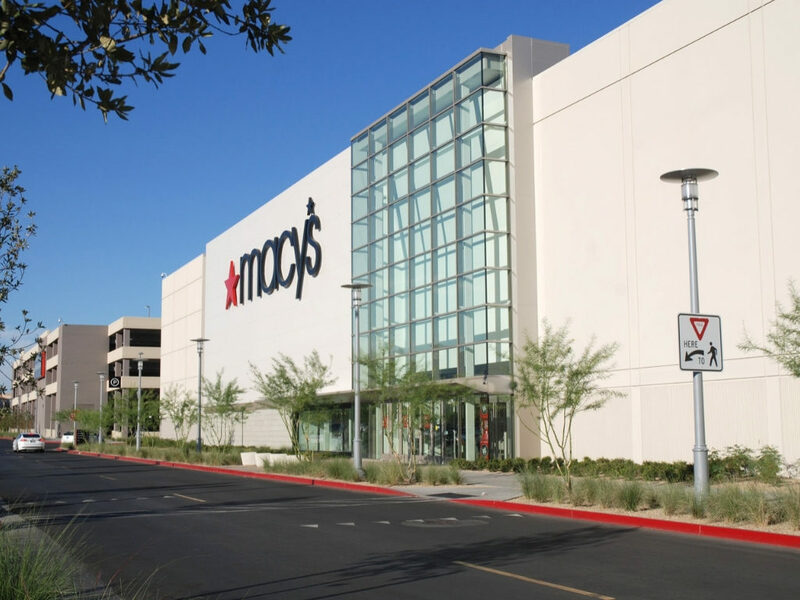 The Macy’s project included prototype adaptation of a 180,000-square-foot design that would serve as an anchor store for this open-air lifestyle center. 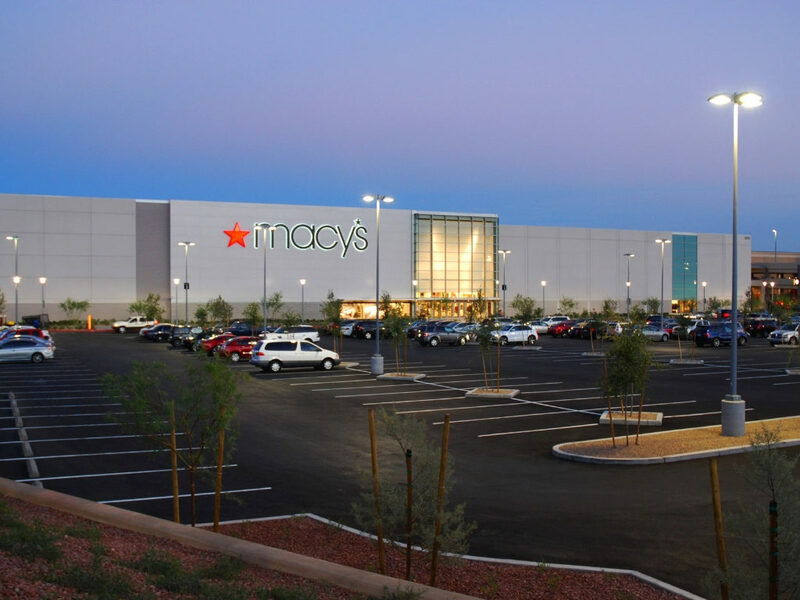 In our plan for the store’s overall design, we adapted Macy’s prototype design to incorporate a Southwest regional color palette and utilize market-driven construction methodologies. 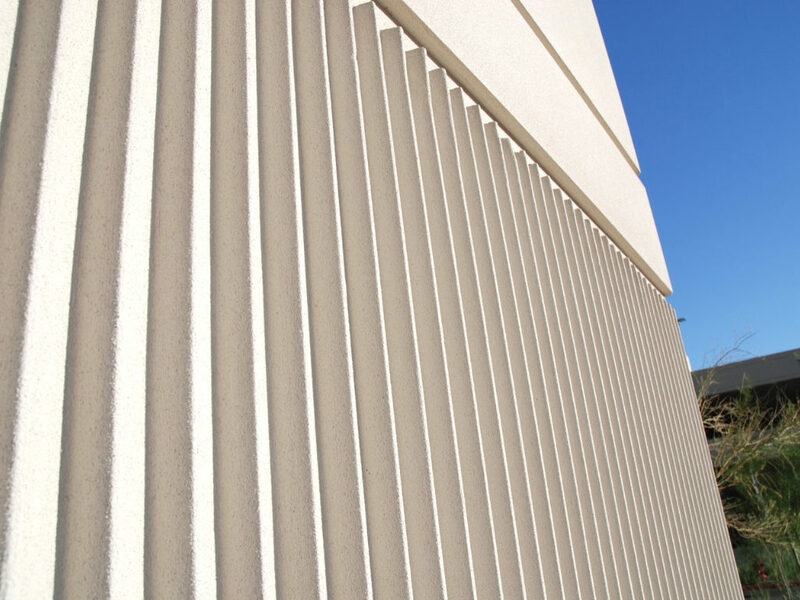 The $218 million project features concrete cast-on-site, tilt-up construction. A359 worked closely with the contractor to achieve specific textures, patterning and coloration. 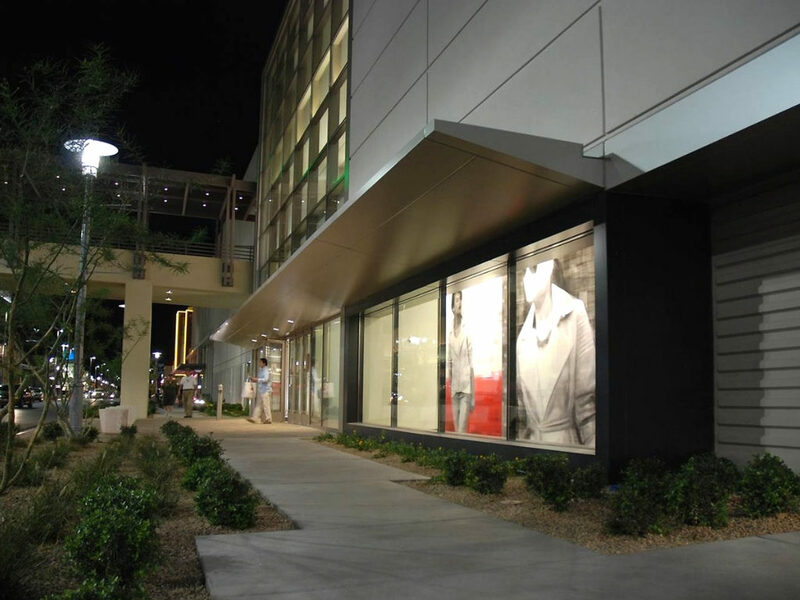 These design strategies allow the store to complement adjacent buildings in Downtown Summerlin and decreased construction costs. 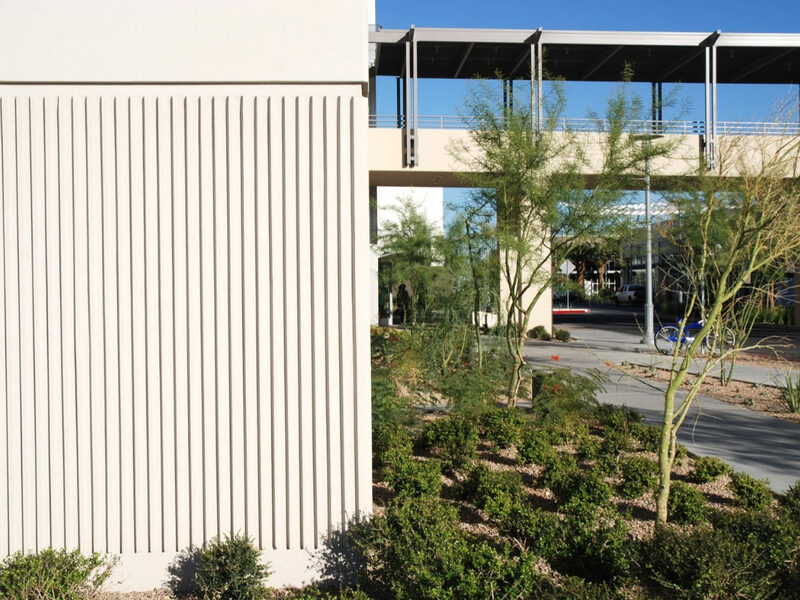 Our landscape architecture design called for sustainable desert-inspired landscaping at each of the store’s four exterior entrances. A Starbucks Café was integrated into the north entrance of the store. The two-story retail building also features two bridge connections to parking. 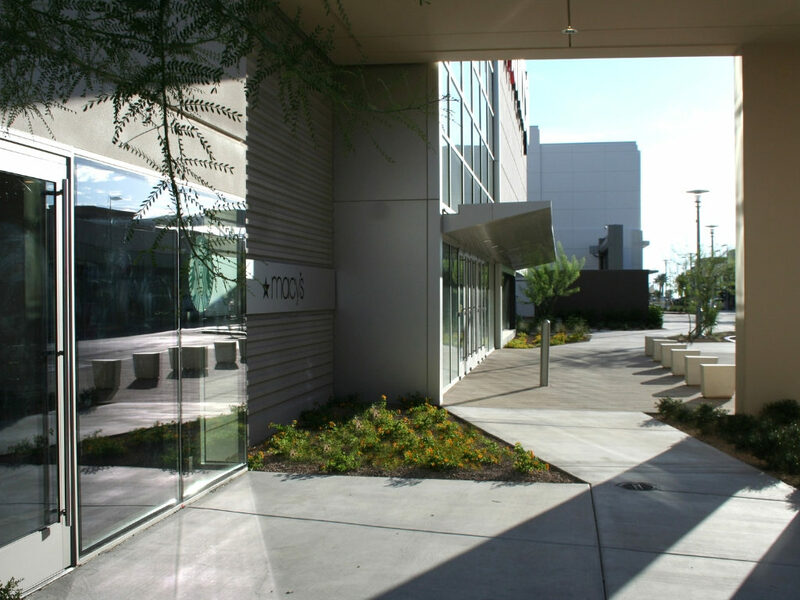 As with many of our projects, we worked closely with collaborative partners on this retail space. Structural engineers Uzun + Case, MEP engineer SSC Associates and landscape designers SWA Group played key roles in the project. Renovation involved complete gutting of former “big box” store down to the existing structure and rebuilding the 200,000-square-foot envelope. The prototype adaptation involved extensive consultations and approvals with the historically registered community of Greendale. Site planning connected the store to a planned greenbelt and included a highly landscaped entrance off the center's transit stop. This project included a completely new interior. 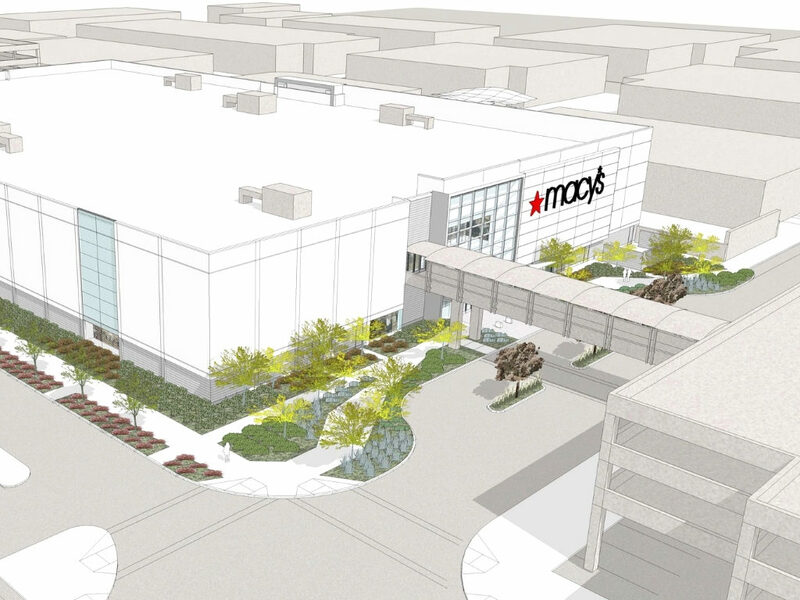 When the adjacent mall was demolished to build a new open-air regional center, Macy’s remained standing as an anchor. It was partially renovated to fit the context and configuration of the new center. The project included an entrance transformation, new chiller plant and upgrades a 200,000-square-foot store originally designed as a Bamberger’s in the late 1960s. This renovation and expansion consolidated two Macy's boxes into a single, 286,000-square-foot store. This project required a Macy's prototype adaptation. The process included extensive review and approvals from the local jurisdiction to leverage the design of the new store as a catalyst for a newly imagined gateway district for the community. Renovation included the design for a new restaurant within the store. 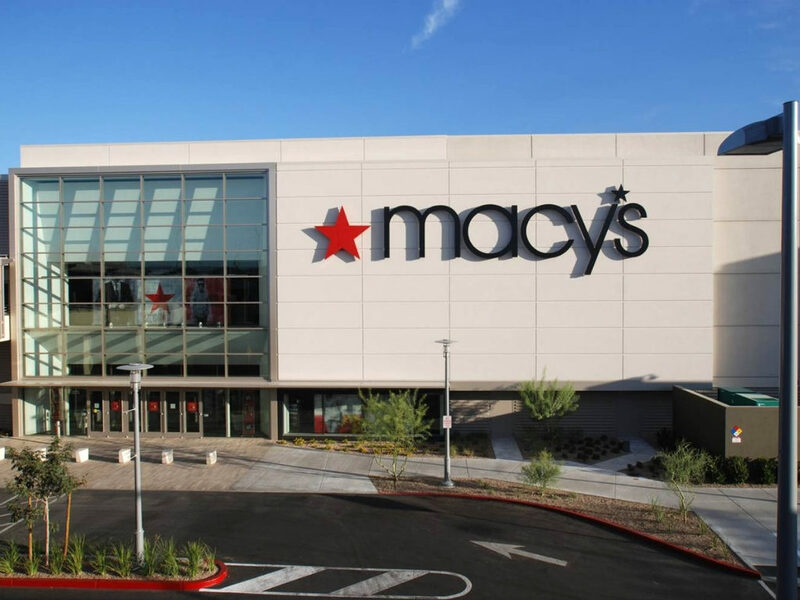 This project entailed renovation and expansion of existing mall leasable area to create a new store for Macy’s. We adapted the Macy's prototype design for the exterior wrapper. We guided the project through extensive review and approvals from the local jurisdiction to harmonize the store design with community themes. A fast-tracked project required the issuing and coordination of a series of permit packages in order to keep the project on schedule. 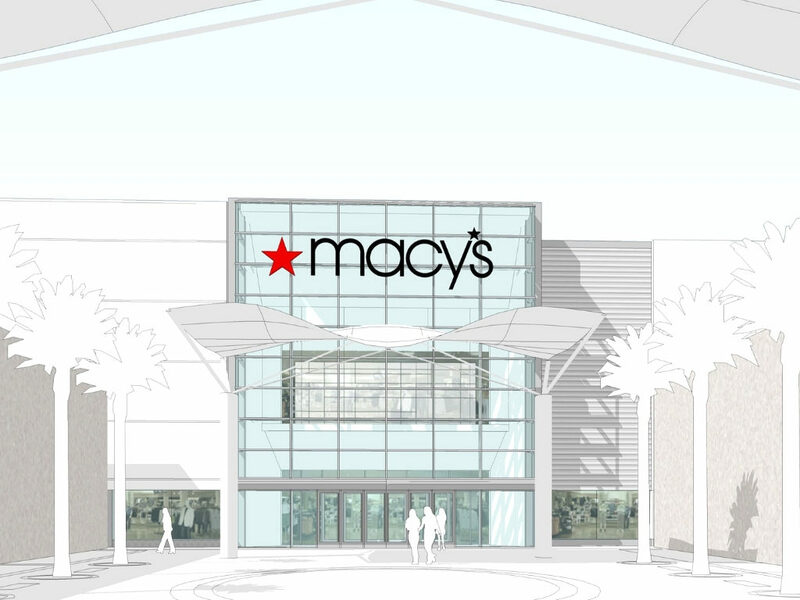 Renovating and consolidating two Macy's boxes created a single, 170,000-square-foot store. 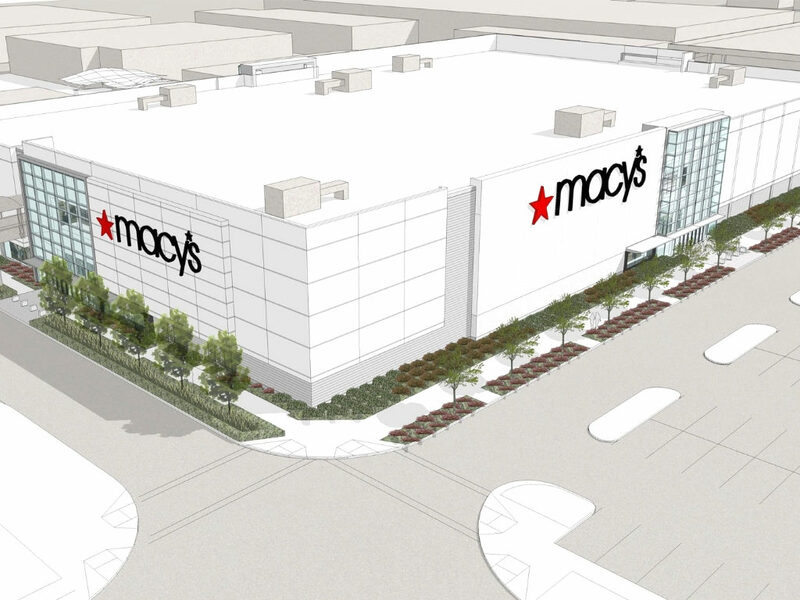 We adapted the Macy's prototype design for the new store exterior. The project included connection to a new garage as part of a planned urbanization of the city's retail district. We worked through extensive local reviews and approvals as well as Title 24 compliance. 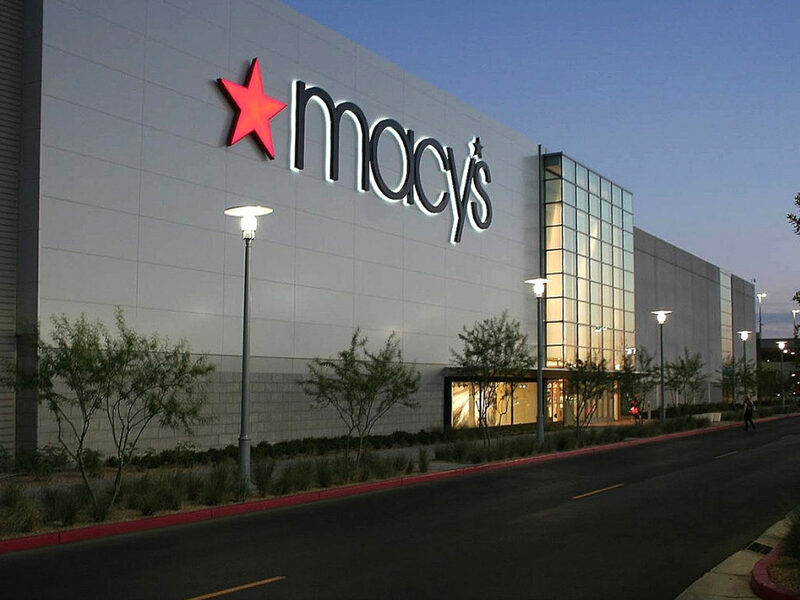 The addition was Macy’s first LEED certified retail space. 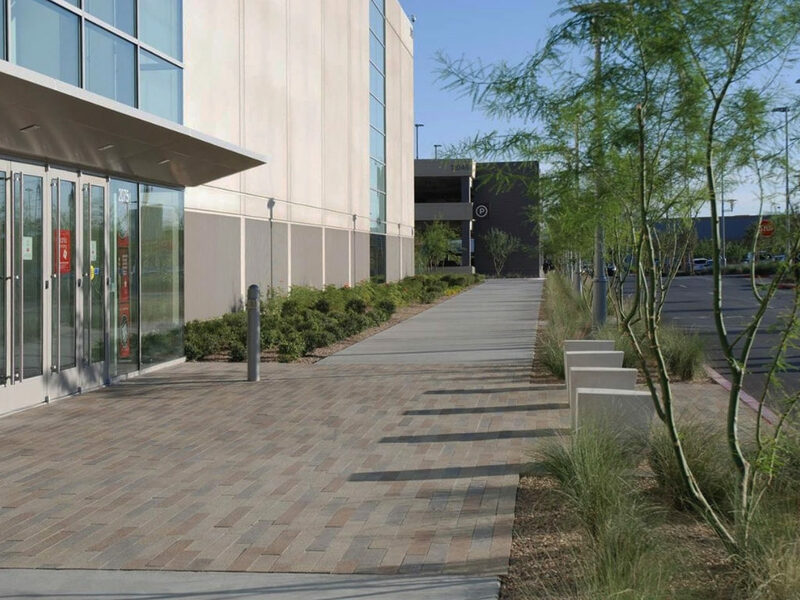 A new 160,000-square-foot store project included landscape design and a café with an outdoor terrace. We adapted prototype finish colors to meet local design guidelines. 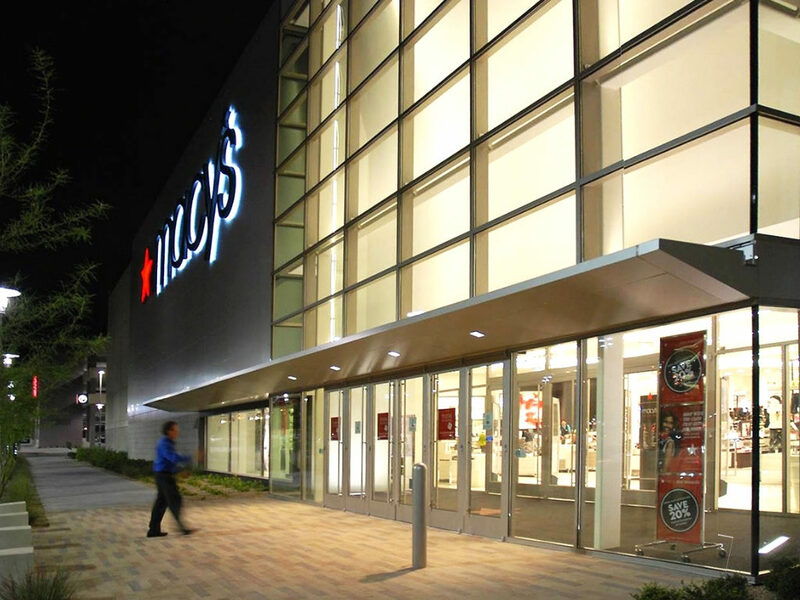 The design featured three exterior entrances and one interior mall entrance.